Zhangjiajie Tu Minority people specially love hot food as the hot ones can stimulate the appetite, strengthen spleen and also can improve assimilation. 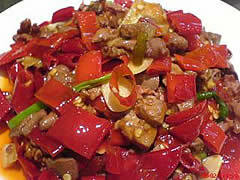 Men and women, children and old people all like eat hot and spicy dishes. They have three meals in a day. And they eat hot dishes in every meal. 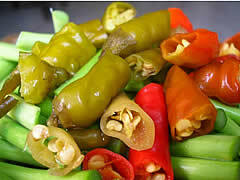 Major chili-pepper dishes can be found on Tu Minority tables are stir-fried pepper, dry-fried chili, deep-fried chili peppers, pickled chili, chili pepper sauce, chili juice and pepper soup and so on. It is said, the Tu Minority people always work quickly decidedly and without further ado, because they often eat chili peppers.